You will be given a reference e-book to read which has 366 pages And the test will be based on that e-book , you can take final test within 1 year of purchase. What is Macromedia Flash 8? Macromedia Flash 8 refers to a highly powerful tool developed and introduced by Macromedia to the public which works in overcoming expectations for creators. This tool was created originally with an aim of realizing colorful animations designed primarily for the web. You can also use it in creating attractive and animated GIFs. There are a lot of reasons why the Flash 8 is now used by a wide range of users. One of these is that it offers extraordinary possibilities. It is not only designed to develop animations because it can be used for more useful applications. Aside from helping you create attractive animations, you can also use Flash 8 in repairing any lack in the internet. You can also use it for interactive applications and this is extremely useful in seeing more attractive designs for the web. Another advantage of Macromedia Flash 8 is that you will never experience difficulty handling it. It allows you to enjoy a more user-friendly environment. The attractive designs of Macromedia Flash 8 are among its most remarkable qualities. This tool gives you the chance to enjoy highly attractive visual effects that give you an easier time creating appealing presentations, forms and animations. Font optimization is also easier with Flash 8 around. The tool offers a lot of readability options that work in improving the readability of texts. It also allows you to edit font optimization and select configuration which is pre-established for static and dynamic texts. The tool also offers more powerful animation and graphics, consolidated libraries and video importing improvements. 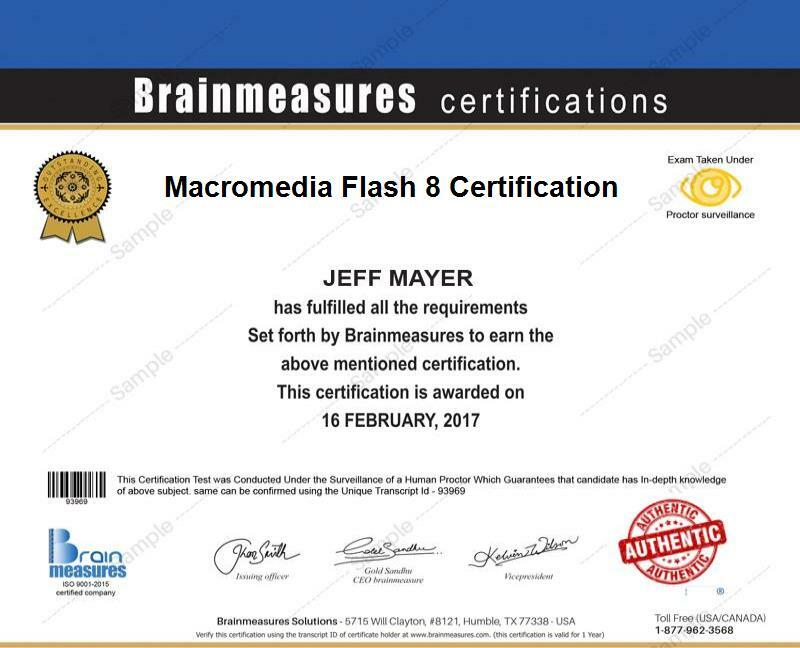 The Macromedia Flash 8 certification program offered by Brainmeasures is perfect for you if you have longed to obtain a more complete understanding about how Macromedia Flash 8 works. Brainmeasures has been in the field of providing the best online certification courses to the public for a long time already so you have an assurance that the Macromedia Flash 8 course that it offers can provide you with the kind of knowledge that you wish to obtain. By deciding to enroll in this certification course, you will get the chance to undergo a Macromedia Flash 8 training which works in your attempt to learn how the tool works, its major benefits, its most remarkable features and the specific things that you can do to take full advantage of Flash 8. Earning a Macromedia Flash 8 certificate is highly beneficial because of its ability to provide a strong indication that you are skillful and knowledgeable in this specific field. How to effectively publish files created through Macromedia Flash 8? The Macromedia Flash 8 certification program is suitable enough for you if your objectives include strengthening your knowledge about Flash 8. You can expect this certification course to be extremely beneficial for all aspiring and existing web developers, designers and programmers who want to use Macromedia Flash 8 in creating the most attractive applications, programs and animations. With the help of this certification course, you will get a more comprehensive overview about Macromedia Flash 8 so using it to your best advantage will no longer become impossible. A higher level of salary can also be expected as soon as you complete a Macromedia Flash 8 certification course. With the presence of your Macromedia Flash 8 certification, you will find it easier to get the position of a Macromedia Flash designer which gives you the chance to earn an average annual salary of $69,000. You can also use your certification to work as a Macromedia Flash 8 consultant which allows you to enjoy an annual salary of around $80,000 to $110,000.